I know it seems like I pick on Philip a lot. But damn, sometimes he just makes it so easy. The scene is Saturday night. We had dinner, met friends for drinks, came home, shared a milkshake, watched TV and were getting ready for bed. Philip had his black retainer case out on the counter which was notable for a few reasons (1 of those reasons is that at 30 he was still wearing the same retainer from 1993, but that's a different post). But the main reason I noted the case is because the previous weekend he had lost his retainer when he projectile vomited into a trashcan after a night of boozing and dancing at a friend's wedding (I WILL get my hands on that video. Promise). He was very upset by the loss of his retainer, mostly for nostalgic reasons I think. I was impressed that he would even put his retainer in in his drunken haze. Anyhow, he talked to his dentist and was scheduled to get a new retainer (lucky me). So, seeing that case on the counter, I said, "Oh, did you get a new retainer already?" I looked at him warily, because we have added "wariness" to our relationship out of necessity due to uncertain hours, constantly changing schedules and moments like this one: "So, why do you have the case out?" 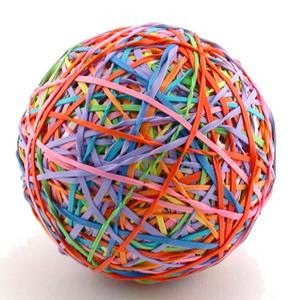 To which he replied, matter of factly, "I've been keeping my rubber bands in it." "Rubber bands? Like braces rubber bands? Why do you have those?" "No, regular rubber bands that I put in." People, Philip has been cutting off half inch snippets of office rubber bands and sticking them between his teeth at night in some attempt to stave off any shifting that might occur in the two week period before he gets his new retainer. I haven't quite decided whether or not this is ingenious or so extreme as to approach creepy, but I have to tell you that I leaned toward the latter when he smiled and bits of rubber band were sticking out of his teeth willy nilly. It's a good thing he's so smart and good looking. Otherwise, Jesus. I promptly amended his nickname from "Tin Grin" to "Rubber Band Man." Just found your blog through Miss Kriss and am laughing out loud as I read this. What creativitiy your man has! Oh my gosh, I am laughing so hard at this! I am dating an MS4 (long stinkin' distance) who is going into orthopedic surgery (shoot me!) Love your blog!